BMS-986165 is a selective, potent, allosteric inhibitor of tyrosine kinase 2 (Tyk2). JAK3-IN-6 is a potent, selective irreversible Janus Associated Kinase 3 (JAK3) inhibitor, with an IC50 of 0.15 nM. 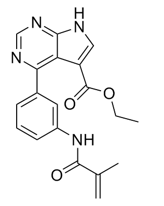 Baricitinib, also known as INCB 028050 or LY 3009104, is an orally administered selective JAK1 andk JAK 2 inhibitor with nanomolar potency against JAK1 (5.9 nM) and JAK 2( 5.7 nM).